For other people named Robert Thomas, see Robert Thomas (disambiguation). Born in Rochester, New York, Thomas graduated from McQuaid Jesuit High School in Rochester, where he excelled both academically and in athletics, lettering in both football and soccer. He attended the University of Notre Dame where he kicked for the football team, including kicking the winning field goal in the 1973 Sugar Bowl victory over University of Alabama, which clinched the AP National Championship that season for Notre Dame. He received his B.A. degree in Government in 1974 and was named an Academic All-American in that same year. He received his J.D. degree from Loyola University Chicago School of Law in 1981. Thomas had a twelve-year career as a kicker in the National Football League. He played for the Chicago Bears (1975–1982 and 1983–1984), the Detroit Lions (1982), the San Diego Chargers (1985), and the New York Giants (1986). He was elected circuit court judge in DuPage County in 1988. There, he presided over civil jury trials and was the Acting Chief Judge from 1989 to 1994. In 1994, Judge Thomas was elected to the Illinois Appellate Court, Second District. On December 4, 2000, Justice Thomas was sworn in as the Illinois Supreme Court Justice for the Second District. Justice Thomas was elected to serve as Illinois Supreme Court Chief Justice on September 6, 2005, and served as the Chief Justice until September 5, 2008. On January 1, 2011, Justice Thomas authored the Illinois State Supreme Court decision Maksym v. Chicago Board of Elections that overturned a lower court ruling that Rahm Emanuel was ineligible to run for Mayor of Chicago. In April 1996, Thomas was inducted into the Academic All-American Hall of Fame. In January 1999, he received the NCAA Silver Anniversary Award. Justice Thomas is a member of the DuPage County Bar Association. In 2007, Justice Thomas was awarded $7 million in a successful defamation of character lawsuit against Bill Page, a former columnist at the Kane County Chronicle. Thomas' lawyers alleged that Page had essentially accused him of official misconduct, a felony. Page wrote in his column that Thomas had traded his vote on a disciplinary case in exchange for political support for his favored candidate in a local judicial race. The case was significant because it prompted an Illinois appellate court to establish a judicial privilege in Illinois, allowing judicial deliberations to be kept private, much like doctor-patient discussions. 1 2 3 4 5 6 7 8 "Robert R. Thomas, Supreme Court Justice". IllinoisCourts.gov. Retrieved May 8, 2016. ↑ Kleppel, Ken. "From The Gridiron To The Supreme Court". University of Notre Dame. Retrieved 2008-01-30. ↑ "Robert R. Thomas, Supreme Court Justice". ↑ Seelye, Katharine Q. (November 20, 2006). "Clash of a Judge and a Small Paper Underlines the Tangled History of Defamation". The New York Times. Retrieved March 28, 2008. "Robert R. Thomas, Supreme Court Justice". 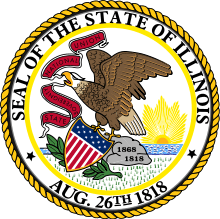 IllinoisCourts.gov. Retrieved May 8, 2016.